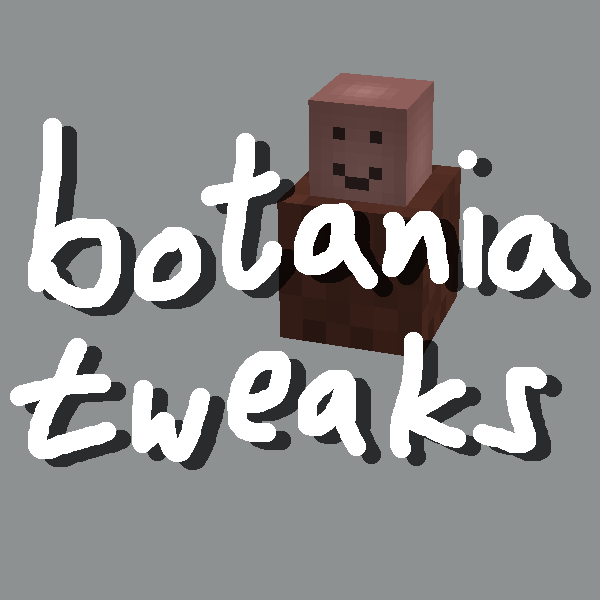 Botania Tweaks is a mod that patches up Botania. Inside, there's quality-of-life tweaks, configurability tweaks, tweaks for modpack makers, silly tweaks, and more! Set the passive decay timer to anything you want... as long as it's shorter than the default value. Choose additional flowers to experience passive decay. Even flowers that aren't passive! Nerf or buff the FE output of the Mana Fluxfield, to match your modpack's FE ecosystem. Force the Orechid to run with Garden of Glass costs, even in normal worlds. This is really OP btw. Buff the mana output of the Spectrolus flower. Buff the mana output of the Rosa Arcana, when it picks up XP orbs. Nerf or buff the mana output from manastorm charges. Make the Entropinnyum flower only accept vanilla TNT. Make the Entropinnyum flower reject TNT from a TNT duplicator device. Reduce the price of the flint-to-gunpowder recipe, for nefarious Entropinnyum cobbleworks purposes. "Advanced Mode" Crafty Crate: make the crafty crate use mana, in a strange way. "Advanced Hard Mode" Crafty Crate: very strict mana input requirements; extremely difficult to automate without wasting tons of mana. "Unlock" the petal apothecary, allowing any items to be accepted in your recipes. Create your own Terrestrial Agglomeration recipes, with custom multiblocks, particle colors, and even multiblock transformations. JEI support included! Learn how to do it. Create your own Lexica Botania pages for these custom agglomeration recipes. Learn how to do it. Use NBT-aware item matching logic in the Petal Apothecary and Runic Altar. Change the size of the Guilty Mana Pool. Two advancement triggers that all players will earn once a certain amount of mana has been generated, with an optional restriction as to the flower type. Learn how to do it. Enable the "click on water to create water bowls" mechanic, even without needing a Garden of Glass world. Potted Tiny Potato. You can put the tiny potato in a flower pot. It's very cute. Galactic Potato. It's an octuple compressed tiny potato. A whole meter wide, and rainbow color. Also very cute. Sheep can eat custom Botania grasses, like they can with regular grass. Automate crafting Ender Air, with a Dispenser in the End dimension. Automatically place Corporea Sparks and decorate them with Floral Powder, when you place blocks like corporea funnels, corporea crystal cubes, etc. Never forget a Corporea Spark again! If Avaritia 1.1x is present, a Dire Crafty Crate will be added: it's a nine-by-nine Crafty Crate, able to craft all your favorite Extreme Crafting Recipes. If Extended Crafting is present, four Extended Crafty Crates will be made available: ranging from 3x3 all the way to 9x9, they are able to craft all your favorite Extended Crafting Table recipes. Tweaks that work on all functional flowers from Botania also work on the Petro Petunia from Floralchemy. All tweaks default to off unless enabled in the config. Portions of this mod use code modified from Botania (Botania License) and Gotta Go Fast (MIT). Learn more on the Github repository. How does the NBT matching work? Does it use the normal .withTag() function or something custom from this mod? I have tried the .withTag() and it almost works. The recipe shows up in JEI as requiring the NBT specific item, but in practice the recipe works regardless of NBT. Can you add the option to configure the amount of mana produced by the munchdew? Dynamic trees kind of breaks it and I was hoping to nerf them without making them decay. So, after downloading the latest version of Botania tweaks, latest version of Botania and Baubles, after i put it in my mod folder, my minecraft crashes, anything for me to tell you for you to use? These were the only mods in the mod folder, allocated 4GB of ram too. Yay, finally a mod that helps automate avaritia! It would be cool if a sheep who ate a coloured grass became that colour wooled.